It’s nice to find another paranormal blogger who actually does research! Happy to know you, too! And who researches. There is some hope! Mr. Lawless goes around taking pictures of “abandoned properties” so he can sell his images & bogus stories to sites like this one. I’ve tried to locate several of his “properties” simply using Google maps and you can clearly see on the street view it’s not the same building he photographed and is trying to sell as “haunted” He’s a sheister out to make a buck! I went to the Youngstown Health Department in Mahoning County and there were NO dealth records for Benjamin Albright. I am going to the main library tomorrow to do more research. I see another person is questioning a house in Madison, Ohio that she says was a couple miles away in Geneva. There should be newspaper articles from 1958 about the Albrights murders if there are I’ll find them and let you know. I agree! I’ve looked everywhere. Something that huge would have been all over the news. Thanks for the legwork! I searched Ancestry.com and came up empty handed. Keep me posted! Yeah this was pretty upsetting, I saw Lawless’s photographs and saw this one was from Youngstown where I’m from. 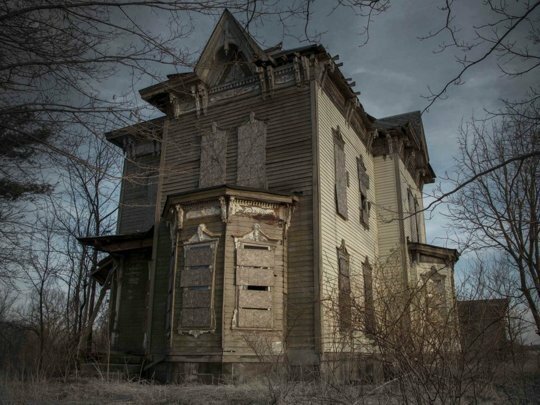 The story sounded tragic and peaked my curiosity to go investigate the house and then couldn’t find any information. But I did find your page. At least you found my page questioning it. I’m going to write more. This house doesn’t need to be marked as evil when in fact it isn’t. That story, if it’s true, does not belong to that house. I know where the house is, and it was inhabited after 1958. I agree. I even searched Google Earth and couldn’t locate. Sad to label a house as evil when it isn’t. I too have seen that house recently and upclose. The picture taken by Mr. “Lawless” is in itself very deceptive. The upward angle he shot does not show that the house has a brand new roof on it. Furthermore, the side angle, with the lighting, does not readily reveal that the right side of the house has been recently painted. it is a lighter color than the front of the house. The people who own it do not live there but have been trying to fix it up. The boards on the windows (which are actually sheets of Oriented Strand Board, which is a material much more modern than 1958) are to keep nosy story tellers like Mr. Lawless out. Love it! I especially like how you detail the boards. I’m amazed at how little “research” these journalist conducted. Thanks for commenting! Robert Johnson – Where is it located? We live in Youngstown. No one here knows anything about this house, including local historians. Really? Not surprised. I couldn’t find anything online and in research databases. Very sad. It’s no surprise that there’s no listing for this home in Youngstown, especially when it’s located an hour and a half away. I’ve had the pleasure of photographing this beautiful home many times. Mr. Lawless’ claims that the home is still full of belongings is a complete sham. The only things left in the home is an old table and beer cans from local teenagers. I’ve even spoken with his girlfriend, also a photographer, on serial occasions, and she didn’t seem to have any idea on the history of the home, so it’s intwredting to me that he would come up with such a bold and unbelievable story. I’ve also had the pleasur of speaking with the old sheriff in Milan, Ohio about the home he claims “belongs to a witch, buried beneath the front porch”. The sheriff pulled up while I was photographing the house. He informed me that it used to be an Inn, hosting travelers who came through town back in the 1800s. The family who owns the home still lives in the town and works on the farmland directly next door. It makes me sick to think that this man, although he may be a talented photographer, is making money off of complete lies. How great to get that information from the Sheriff! It would have been so easy for Lawless to get the real stories instead of making junk up. Huge thanks for posting! Your looking in the wrong place!! There is an error somewhere. This house is located on State Route 224 in the township of Nova/Ruggles Troy. I believe it is Ashland County. It is just a few miles from where I live. Yes, the house is similar to the Ruggles House; however, there was no murder-suicide that occurred there. The Ruggles House is listed as potentially haunted. Still a deception on author’s part. From the best I can tell the address is 1253 US 224, Nova Ohio. Just came back from The Mahoning County Library in Youngstown, Ohio. I spoke to the reference librarian. He researched this already and said this house is located in Nova, Ohio and can be reference through the Ashland County Library. Nova, Ohio is no where near Youngstown. What possessed the writer to even say that? Lol, I wrote about the info I found on his facebook page, lets see if he answers back. Yes, I would love t see if he writes back! Highly doubt it. Kudos for trying! Lawless/Joe Melendez is a pathological liar, it seems. If you challenge him, he will delete your comments and possibly threaten you (as he has done to others). In full disclosure I deleted another comment that I felt was threatening and was beginning to target others who have posted. Thank you for your candid comments. They move the discussion forward. But this house was not the scene of a murder-suicide. Gotta love your local librarians! If you put in … nova ohio historical. Without the periods there are 2 pictures of this house. I was born and raised in Ohio, still live here about a half hour from Youngstown & I have searched & Searched for this story & NOTHING! No local Historian knows anything about this. I contacted Steph Lawless & he gave his thank yous of the photo but no real answer about the story. Must of been a money grabbing technic. Surprised he even responded. Thanks for the posting. I agree! Great article. Well researched. Hope you weren’t threatened for publishing. Thank you so much for sharing! Thank you for posting, Dominik. That is very good to know that the book states it is fiction. I would have liked to see a copy of the book, but was not willing to pay that much and I don’t know of any libraries that have purchased it. Librarians do prefer to know whether a book is classified as fiction or non-fiction, and I was not personally able to get an answer to that question from the publisher. My friend’s family rented this house in the 90’s from the farmer who owns it and farms the surrounding fields. The paint is NOT recent though from an above post. It has been about three different colors for as long as I can remember (30 yrs.). I really wished when I was younger, and playing hide-and-seek, that it was haunted. I never had the honor of encountering any of the undead. It has the perfect physique for a haunted story though. Yes, it does. It is beautifully spooky. I lived in this house in 1962 and I can most definitely tell you that no one killed anyone there. It was a cool house with a great spiral staircase, I enjoy thinking about this house and my childhood when I lived there. The owners name at the time was Elmo Fruth and He was a very good man. My dad worked on Elmos farms for many years to help raise us, all good memories there. The house was also occupied for years after we moved out. I amazed at how much information everyone has contributed on this house. Many thanks! My husband and his family lived in this house in the 60s. I have lived in Nova and Ruggles all my life and have never heard about a death in this house. my name it Randy Knowlton I lived in this house on 224 in Ruggles ohio in the 1960s there was no murder there in 1958. Seems the house inspired a lot of urban legends. There were people who lived in this house after 1958. I grew up in Nova, the people who lived there were friends of the family. I was inside this house many many times. The inside of the house was beautiful at that time. But it has been empty for several years now. But the people lived there in the 80s. Terrible destruction of the staircase. Houses like this should be restored. I am very familiar with this house although the history of it that I’m aware of is after the 1958 legend. In the 1970’s a family, the Bairs, lost their home in Kentucky to a fire. My father opened our home to them at the time and they lived with us in Polk, Ohio for nearly a year until they found this house in your article. It was in better condition at that time, obviously. As kids we spent a lot of time playing in that house with the Bair family’s children and to us that house was truly huge. We were fortunate to have seen that house as an actual inhabited home. It had a spiral staircase in the front portion of the house, a second “servant” stairway leading from the kitchen to the mid-point of the main hall upstairs, and there was a huge ball-room sized room downstairs off of a lobby-type room that had very ornate design work on the ceiling and an enormous light fixture. The windows were fitted with wooden shutters and each of the rooms upstairs were equipped with wood-burning stoves for heat. The rest of the house was heated by a huge coal furnace in the basement. The basement also housed an enormous coal bunker for that purpose. There was also a platform on the very top of the roof that was accessed via a hidden stairway that was itself accessed from one of the rooms upstairs. This was a very large and, to a child at the time, cool house. Over the years after the Bairs left, it spent long periods of time vacant and on/off the real estate market as people would purchase it with the intent of restoring it, probably discovering how huge and expensive it would actually be to actually do it. As for the legend about that house, I recall hearing about some tragic event but as far as I know the details of the most commonly told legend are most likely an embellishment of something that probably did happen there. I totally want to live there. The pictures do not capture the expansive size. Thanks for elaborating! I was born and raised in Ruggles, and delivered coal to the “Nova House” in the early 60s. No ghosts, just nice people. The old gentleman who owned it at that time was a bit eccentric but nice enough. He lived nearby on another road. http://www.telegraph.co.uk/culture/photography/11201309/American-Horror-Story-haunted-houses-photos.html this website says he made it all up. Original stories did not say the stories were made up. The press releases implied that the stories were in fact true. I’m glad he clarified. my buddies grandpa owned the house and passed it to his uncle who owns it now. I’ve been here a million and a half times. Spent a whole summer here and ended the year spending Christmas night in the barn out back. Ahhh good times. I go by that house often and tell the wife we should find out who owns it, but it, and fix it up. Beautiful house! A friend of mine at work told me about an experience she had going into this house! She claims to have had an encounter with a ghost or spirit who told her to get out of this house. My sisters and brothers-in-law (who still live just south of this house) and I went out to it a few years ago, but of course we did not go inside. It’s weird to be hearing about it again since my friend at work was just relaying the whole story of her encounter again at work this week! I’m taking this info with the Nova House picture to work and she is going to freak out!! My son and I were in Toledo a few weeks ago and driving home to Pennsylvania we took the scenic route. My husband is from Ohio and when we visit, I see some pretty amazing, stately homes that are boarded up and just left to sit. We were driving on Rt 224 and saw this beautiful home, I had no traffic around me at all and quickly stopped on the side of the road. It was gorgeous and I just had to take its picture. I took a few pictures of the front and backed up a little on the road to pull into the driveway some and took more pictures from the side. The detail in the molding around the windows and top of the house are just beautiful. I made it a mission to find out more about this house, it intrigued me. Glad I stumbled upon these comments. Pictures do not do this house justice, its a must see in person. I would give anything to have seen this house in its glory.Thank you all for the information! One day I will venture up that way and see. The house looks gorgeous. Too bad the “author” loaded it with such baggage as a bad, horror house. If Lawless (real name Joe Melendez) were to mention that his entries were fiction, he could easily pass “13” off as a coffee-table book matching essays with images and no one would think any less of him for doing it. Instead, he’s made the conscious choice to make up stories out of whole cloth and try to pass them off as actual events, which makes him a liar looking to make a quick buck. As compelling as some of the images in “13” may be, Lawless/Melendez will not be getting any of my money, and it appears that the blogosphere is doing its part to inform everyone else of Lawless’/Melendez’ mendacity before they part with theirs: http://sephlawless.blogspot.com/. Well done.